Join in the hype and have the ultimate experience with Spinning Classes Walsall! Our popular instructor lead group classes in Walsall will have you super excited to start. You will be sure to experience an exciting and intense class each time, and you will leave feeling energised after an incredible workout. You will be pedalling to heart pumping music while burning calories by the minute per class. Our energetic Spinning classes in Walsall are open to anyone no matter your fitness level or experience. You may be a beginner or an expert pedalist, we invite you all to come and join the fun at our Simply Gym Spinning Classes Walsall. 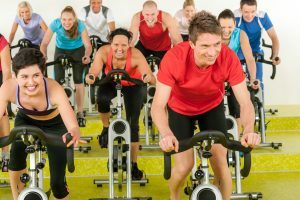 If you want to have one of the ultimate cardio workouts included in your routine then Spinning is definitely the way to go. There are a variety of health benefits for both the body and mind that indoor cycling can bring. Spinning is one of the most intense yet highly addictive forms of cardio. This is because you pedal to the beat of the loud music with the spirit and energy of our Simply instructors. Surrounded by the colourful lights in the room giving the atmosphere of competition. Our Spinning classes in Walsall are an excellent cardio based exercise that sculpts and tones your body. Being a fantastic group workout it can help tailor your ability, de-stress and meet new like-minded people. All of our Simply Gym instructors are full of energy and love to get everyone involved in our fun classes so you can be sure to meet fellow spinners and pedallers from different backgrounds! Our Spinning Classes Walsall typically last between 45 minutes per class and usually run every day of the week. Be sure to check out of timetable for the times that suit you and your schedule. We can’t wait to see you join our fellow peddlers! 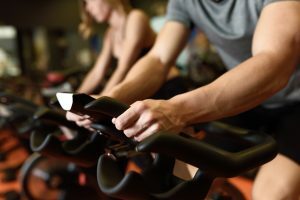 At Simply Gym, our Spinning Studio is equipped with specialised indoor spinning bikes, incredible fast paced top chart music and ultimately friendly instructors with like-minded fellow spinners. All you need to worry about bringing is yourself, a towel and plenty of water to stay hydrated. Let’s get ready to work up a sweat and let’s go for a ride.